Centre Elite Gymnastics will be closing at 1pm on Friday, March 30 for the Easter Holiday weekend. There will be no Friday Night Open Gym and no Classes, Preschool Open Gym or ToddlerTime on Saturday. The gym will re-open and return to our regular class schedule on Monday, April 2. CEG is OPEN - Wednesday, March 21, 2018. Centre Elite Gymnastics is open and will be running all classes and programs as regularly scheduled. New BODYCOMBAT Class Time Starting 3/14/18! Centre Elite has added a new BODYCOMBAT class to our weekly schedule! Beginning Wednesday, March 14 please join us for BODYCOMBAT at 6:15pm! Come and fight with us on Wednesday night! Hope to see you there! There will be NO Recreational gymnastics, tumbling or preschool classes. There will be NO Saturday Preschool Open Gym, Toddler Time or recreational classes on March 3 or March 10. There is NO Friday Night Open Gym on Friday, March 9. Preschool Open Gyms will be held during the week as normally scheduled. Toddler Time will NOT be held on Monday, March 5- ONLY on Thursday, March 8 at 9:30am. All Adult Fitness classes (live instructed and virtual) will be held as regularly scheduled. CEG Spring Camp will be held Tuesday, March 6 through Thursday, March 8. Half & Full day options are available. Due to the inclement weather that we are still experiencing, Centre Elite Gymnastics will be closed on Wednesday, Feb. 7, 2018 for all afternoon and evening classes. There will be no gymnastics classes, tumbling classes, preschool classes, fitness classes or team practice this evening. Centre Elite plans on re-opening for all regularly scheduled classes and open gyms on Thursday, February 8, 2018. Due to the inclement weather, Centre Elite Gymnastics will be closed for all morning classes - including preschool open gym and fitness classes- today, Wednesday, Feb. 7, 2018. As the storm progresses through the area we will make a determination on status of the afternoon classes and team practices. A decision to open for evening classes or remain closed will be posted by 2:30pm- please check back periodically for updates! Centre Elite Gymnastics will be opening at 10:15 am today, Monday, February 5, 2018. The 9:30 am Toddlertime has been cancelled. Kindergym Elite will run from 10:15 am to 1:15 pm so please pack your child a lunch if they are enrolled in Monday Kindergym. The 10:30 am Preschool classes and all other classes will run as regularly scheduled. Due to the inclement weather, Centre Elite Gymnastics will not be holding Warriors or Adult Gymnastics classes this evening, Sunday Feb. 4, 2018. February Fitness Promotion at Centre Elite! Call us at 814-380-0894 or stop by the office for more information about Fitness Classes at Centre Elite! Sign up today for our February Fitness Promotion! Centre Elite will be opening at 10:15am this morning, Wednesday, January 17. The 9:15am Preschool Open Gym and Virtual Fitness class are cancelled. Kindergym will run from 10:15am to 1:15pm. If your child attends Wednesday Kindergym, please make sure to pack them a lunch! The 10am Virtual BODYPUMP Class will be moved to 10:15am. All other classes and Preschool Open Gyms will run as regularly scheduled. 7 Days to Launch! Join us for FREE Virtual classes this week! Join us at Centre Elite Fitness this week for FREE TRIAL classes of all of our new Virtual Fitness classes! Attend all of the Virtual Classes you want at no cost from Monday, Jan. 15 through Sunday, Jan. 21! 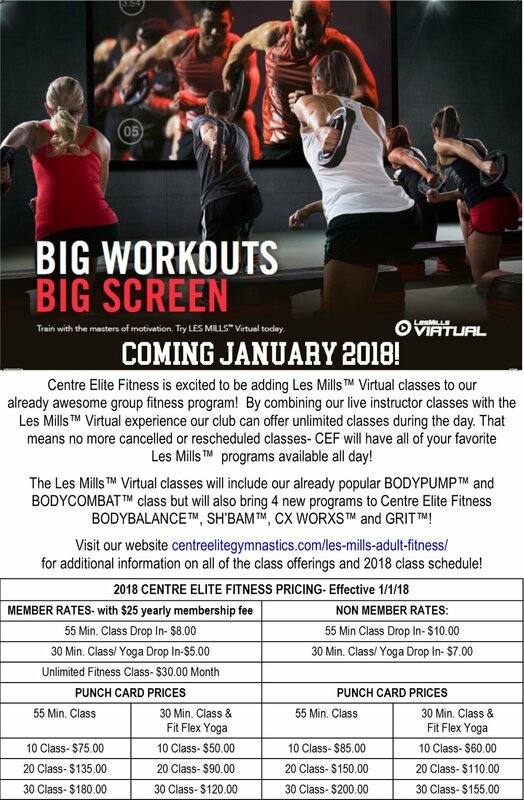 Centre Elite Sports is excited to announce that Les Mills Virtual classes ARE HERE! Join us for free Virtual Fitness classes from Friday, January 12 through Sunday, January 21! Participation in ALL Virtual classes during this week are FREE to current and new students! Try a class and let us know what you think! You can view the schedule online at CEF Virtual Classes. You can click on a class for more information and even reserve your spot in the class! We look forward to seeing you at the gym! New Fitness Offerings In 2018! Centre Elite will be opening at 10:15am this morning, Thursday, Dec. 14. The 9:30am ToddlerTime class is cancelled and Kindergym will run from 10:15am to 1:15pm. If your child attends Thursday Kindergym, please make sure to pack them a lunch! Winter Camp Registration Now Open! Fall Fitness Schedule Begins Aug. 21! The Centre Elite Fall Fitness schedule is set to begin on Monday, August 21. Centre Elite offers Les Mills BODYPUMP, BODYCOMBAT and BODYJAM in addition to our very own Fitness Flex Yoga classes! Take a minute to view the new schedule at CEG Fall Fitness and find a class that works for you! Classes are offered on a Drop In or Punch Card basis so there are options for everyone! We look forward to helping you reach your fitness goals this fall! The last summer Tuesday Night All Age Open Gyms will be held on Tuesday, August 15, 2017. We will begin holding the School Year Friday Night Open Gyms on Friday, September 1, 2017. Make sure to visit us at www.centreelitegymnastics.com/schedule/ to view the gym calendar for special events, Open Gyms and closing! 2017-2018 School Year Registration Opens Monday, July 10! Centre Elite Gymnastics is excited to be offering On-Line registration beginning with the 2017-2018 School Year Classes! Online Registration begins on Monday, July 10! If you are already a customer of Centre Elite please visit CEG Parent Portal to access your account, update family information, enter automatic payment information and enroll for 2017-2018 School Year Classes! If you are new to Centre Elite please visit CEG Online Registration to sign up your family for the 2017-2018 School Year Classes! Please feel free to contact us at 814-380-0894 if you have any questions about the online registration! We are excited to offer this new option to our parents and want to make the transition as easy as possible! While Centre Elite will be closed for all gymnastics, tumbling, preschool classes and summer camp over the week of July 3, we will still be offering a special Fitness class schedule over the break. Please join us for one of these awesome fitness classes next week! We hope to see you at one of these awesome classes next week! Monday Night Yoga will now be held at 7:00pm in the upstairs gym! 6am BODYPUMP will now be held on Monday, Wednesday and Friday! 9am BODYPUMP will now be held on Tuesday and Thursday! We hope these changes make attending a class easier for all of you- hope to see you at the gym soon!